One of the most important factors for lima bean growers in Delaware and throughout the world is the ability to accurately measure and forecast disease occurrence in their fields during the growing season. A new risk model developed by a team of researchers from the University of Delaware's College of Agriculture and Natural Resources (CANR) and the Delaware Environmental Observing System (DEOS), will allow lima bean growers in the state to utilize a free on-line tool to help them assess the risk of having their fields hit with downy mildew, a fungal-like disease caused by Phytophthora phaseoli. The research was funded by a five-year, $1.5 million U.S. Department of Agriculture (USDA) Specialty Crop Research Initiative grant (SCRI). The team includes Nicole Donofrio and Tom Evans, professors of plant pathology in CANR's Department of Plant and Soil Sciences; Gordon Johnson, assistant professor of plant and soil sciences and a fruit and vegetable specialist for Cooperative Extension; and Kevin Brinson, director of DEOS, which is housed in UD's Department of Geography in the College of Earth, Ocean, and Environment (CEOE). Matthew Shatley, computer research specialist, and Chris Hughes, environmental applications developer, both in CEOE, helped develop the website. Donofrio said one of the goals of the grant was to create a risk model that growers and processors could easily access for lima bean downy mildew, adding that this new user-friendly website will be "an excellent tool that our cooperators can use that will inform them when and if they need to spray fungicides." Evans, who has been working on prediction models for downy mildew for 15 years with multiple students conducting research both in the field and in greenhouses, said that an older model predicted based strictly on temperature and rainfall. This newer model uses that predictor but adds dew point and temperature, which is helpful as the ideal conditions for downy mildew may also be found in September when growers encounter heavy dews but not much rain. "The month of September typically has a lot of dew because we have high humidity and low night temperatures. The one that uses dew point is the one that's been predicting the most because most of the occurrences were in September. We haven't had any major epidemics in July and August, which is kind of when we have rainfall driven disease," said Evans. The risk model utilizes a numeric scale from one to 10 and allows growers to assess how much risk they are willing to take on, before taking action. "Everybody has a different risk tolerance and their tolerance has to be taken into account. My recommendation is that you're in high risk when you're in somewhere between seven, eight or nine, but there's a lot of variation in that depending on the field and the conditions," said Evans. To use the website, users request an account via email to deos-info@udel.edu and an account is set up for them. Once the user has an account, they can log in to the website to add their lima bean fields or view risk values of their existing fields. New fields are added to the system by providing GPS coordinates or by using a map interface to select the field's location. Weather data from the nearest stations in the DEOS network are determined using the field's geographic location. Additional information required for each field includes information on the lima bean cultivar planted as well as the field's downy mildew disease history. The website allows growers to look at a set of data and graphs that show them their fields' daily risk value for the occurrence of downy mildew. Knowing their individual risk factor allows them to know whether or not they need to spray their crops, which helps their economic bottom line. "This might cut two or three protectant fungicide sprays out in a year and that might save them $100 an acre. And that adds up over time," said Evans. The less fungicides that growers use, the better it is for the environment and it also gives downy mildew less of an opportunity to develop resistance to the fungicides that are being used. Evans said this model is unique to the state of Delaware and the researchers are in the stages of validating it so that that they can feel more comfortable about setting a general range for growers. "I have not found a system that operates quite like this but that's because we're a small state and it's free data. It's public data and it's being done by people that are employed by the state or the University or both," said Evans. 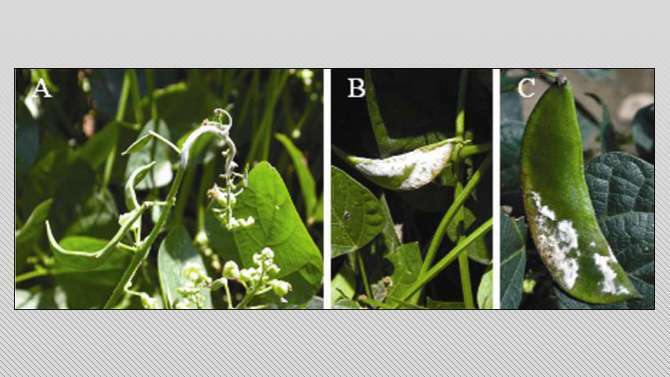 Brinson said that the website should be launched in time for the spring growing season and that to validate the model, the researchers used data from lima bean fields owned by vegetable production companies that have scouts who regularly check their fields for downy mildew. "We loaded that data into the system and then ran the model and did all the calculations and as the risk scores got higher, they would go out and try to confirm the presence of downy mildew," said Brinson, noting that Evans would do a lot of the scouting himself. "I know Tom was literally driving around with his iPad looking at our tool and saying, 'Looks like this score is an eight so I want to drive to this field and check it out.' The research team has put a lot of work into certainly this disease but this particular crop, too," said Brinson.